Call us on (07) 5551 0117. 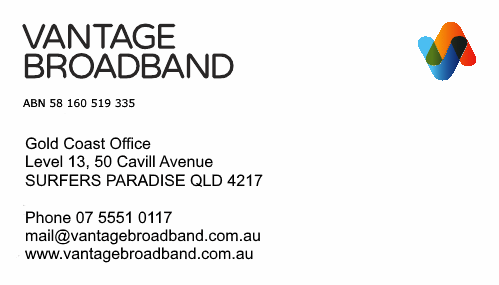 If you live within a Vantage Broadband serviced area or serviced suburb, we will offer to make an appointment to visit your home or your office without engagement. This to see and discuss what the best connection method will be. We will provide you then with a written estimate for the connection fees and the monthly subscription fees. If there are options, we'll make them known to you and will discuss the pros and cons for you to make an informed decision. You can also fill out the form below with your proposed connection address. We will then inform you on the options as available for your area. Please list your complete address with postcode, street name, street number and unit number for the best results.